Malcolm Lee (Best Man and Welcome Home Roscoe Jenkins) is bringing Samuel Jackson and Bernie Mac together for a movie entitled Soul Men. Jackson and Mac will play two former backup soul singers who are part of a famed group that fell apart once the lead singer went solo. Bernie's character went on to open up Car Wash stores and retire while Sam's character started robbing banks and ended up in prison. He eventually gets out. They haven't spoken to each other in 20 years but reluctantly agree to travel cross country together to the Apollo Theater in New York City for a tribute performance in honor of their recently deceased band leader. The film promises to be hilarious. You can hardly lose with a cast of this caliper. Production of the film started in January and it has a release date set for sometime in October. Another aspect that will make this film a must see is that Jackson and Mac will do their own musical and dancing performances for the film. I, for one, can hardly wait. I read about this a month or so ago and was intrigued by the idea. I hope that they have a flashback sequence to their days with the group. They probably will since Sam and Bernie will be performing. Samuel Jackson performed in "Black Snake Moan" so it won't be such a stretch and Bernie is a 70's guy so I can see him doing some backup work. Isaac Hayes must be the lead singer that passes on. And both Bernie and Isaac died within one day of each other..sad.. WoW!! 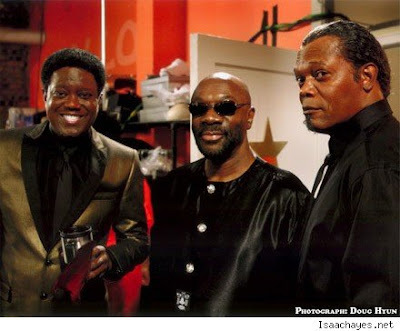 How ironic that Bernie Mac and Isaac Hayes will be starring in an upcoming film and they just "went home" together this past weekend. I can't wait to see the film; and I usually don't see movies in the theatre. But best believe I will be in the theatre to see this one. And I have no doubt that this movie will be the bomb.